Hong Kong, China - So my wife Veronica has started feeding me multivitamins to keep me alive. "I don’t want to spend our post-World Cup holiday in Malaysia with you sick and asleep." The first week of my TV watching epic has passed in a bit of a spongy blur. It feels like a long time since Robert Green decided to give the Americans a sporting chance, since the Germans became the first ones to work out how a jubulani works, and an age since the Swiss showed Beckenbauer what a brilliant idea ‘kick and rush’ can be. What a week it’s been. I wonder if the Swiss will name a cheese after the slayer of the Spaniards, Gelsen Fernandes? It would have more holes than their defense, that’s for sure. But if we’re looking for the best World Cup performance of Cheese naming quality, so far it has to be my good lady wife, Veronica, followed quickly by Lionel Messi. Messi has been good but HE hasn’t taken on my dog-walking duties. No complaints at all have floated my way from my wife. Even when she was on a work conference call with the U.S. Environmental Protection Department discussing their policies toward Asian Shipping emissions, and she had to explain away the shouting and expletive-ridden screaming in the background, she remained surprisingly good humoured. We’ve actually watched a lot of the games together, not that she has a lot of choice given we only have one TV and I have the remote manacled to my wrist. She has half an hour between the first and second game to watch whatever she likes at prime time. My sleep patterns have been less of a pattern, and more of a talentless child’s scribble. The most absurd day was the first Sunday night going into Monday. I had planned to sleep between midnight and 2:30 a.m. when the Australian humiliation against the Germans started, but Bernie Ecclestone conspired against me to schedule the Canadian GP to start at exactly midnight. Cracking race, but it ate up my entire inter-match sleep time, resulting in only 46 minutes slept in a 24 hour period. I’m averaging about four hours a day at the moment and the weekend snoozapalooza I’m planning can’t come quickly enough. Struggling through work has been something of an ordeal, but if people aren’t ridiculing me and calling me ‘such a loser’ (My finger is pointed at you, Anjali Rao), they’re being really supportive. I could have kissed my manager on his big grizzled Scottish mouth when he said I could leave early on Wednesday. My first exhaustion-enhanced piece of idiocy was Tuesday morning. I was so thoroughly drained by the tedium of Portugal v. Ivory Coast that I showed up for the wrong shift at work. I arrived at 5:50 a.m., two hours too early for my actual shift start time of 8 a.m. Placing the blame for this squarely on Cristiano Ronaldo’s impressively broad, sulking shoulders, I found that our office has an underused and extremely comfortable massage chair that I nestled into and slept until my proper shift started. Have I dozed off at all during games? Well, I must admit that I have. Once. During the 2:30 a.m. game of Italy v. Paraguay, I had been bored into a coma by the end of the first half and fell asleep at the half time interval. My dog Buzz came to the rescue three minutes into the second half by inserting his tongue into my ear, which was such an unpleasant way to wake up I had no problem remaining conscious for the rest of the game. Good dog! The TV coverage of the World Cup so far has been excellent. The best piece of commentary I’ve heard was during the Holland Denmark game which went something like this: “The Dutch formation is sometimes 4-2-2-2. … sounds like an archbishop.” But the most excited commentary I’ve heard was when young Winston Reid equalized in stoppage time for New Zealand against Slovakia in a game I thought would be forgotten even before it finished. I did think it was a bit harsh that Reid was booked for taking off his shirt in celebration. If I had scored a goal to earn my country’s first-ever World Cup point, I think I would have pulled my pants down and run around the pitch with my jock strap hanging round my ears. Imagine that in super slow-mo high definition. It has been a World Cup that has started in super slow-mo, rarely reaching the heights we know that it can. So we move on to the second round of matches, greedy for more. The brave Swiss have led the way with their stunning victory that they will be yodelling about for years to come, and who could blame them? After all, they have shown us that what this World cup really needs... is more cowbell. What a fantastic effort to watch all the games in Hong Kong! The World Cup times are extremely easy for American viewers like myself since the times are around 7 and 9 in the morning and 2 pm in the afternoon. I secretly watch most games at work thanks to the convenient times. Is this guy being paid to wach all the world cup games? What a great job! Were can I apply? I don't understand, I've been watching all the games too and I have to work and have a life as well. i'm not taking any vitamins! I'm also in Hong Kong. I invested in a wonder, modern piece of tech from the '80s. A Good ol' VCR. I get up for the 2:30's the excite me (Germany vs Australia, Brazil vs North Korea), but for the one's that have coma written on them, (Italy vs Paraguay, Anything with Italy really) Record and watch at 6:30 before going to work. Almost as good and feel a bit of nostalgia. Although finding a blank VHS tape took FOREVER!!! I Dont know what the big deal is,Im a bar owner in Germany and have watched every game,next week will be hard,there will be two games on at the same time. Some games are really boring. And the worst: some of them are 3:30 am here!!! This has to be the stupidest story I have ever seen on CNN. Who cares if this guy wants to watch every game to the point of negatively impact both his health and his wife's work responsibilities?! The very fact this interferes with his wife's work responsibilities shows the egocentric stupidity of the endeavor. Get a set of headphones... better yet, get a //real// job. I can't believe CNN is paying you to do this. So dumb. So far, so good! I only dozed off for the FRA – URU match, first day, because I wasn't used to staying up for that long. But yeah, since then, it has been alright once my body adjusted to its new sleeping schedule. The first round of games has been rather boring – but thankfully, the second round has picked up, and its looking uphill from here. I give this guy props for staying up for the games. I'm in Korea right now, and just can't do it. Only 3:30am games I will stay up for are when England is playing, the rest I catch the next morning on replay. Don't let the critics bog you down (they all secretly wish they were you!). Although i can understand what lack of sleep must be doing to you (and your wife), i must say this sounds like fun – and yes, the blog was super entertaining. For someone who doesnt care about football (as we call it in India), consider this as a compliment. Cheers to you and your efforts! What your critics don't know is that you live in Hongkong and there is a big time difference, which means matches are almost always shown after midnight. For those in Europe and the US, this literally means very little sleep because of the matches, work, etc. I like how you wrote your article...very entertaining! I live in SEA too. This entry was by far one of the most amusing I've read. Good job CNN for showcasing this blog. Good luck to the author – hope you make it to the finish! Is it only obvious to me that he is NOT BEING PAID to do this? Not only is he giving up his sleep to watch his beloved football but he is spending time writing a blog for his employers. So you people, especially Thomas ("better yet, get a //real// job. I can't believe CNN is paying you to do this. So dumb.") can waste time reading blogs that you don't like. If you don't agree with what he is doing why are you reading his posts? Kudos to his wife too. Lets identify the most important factor. 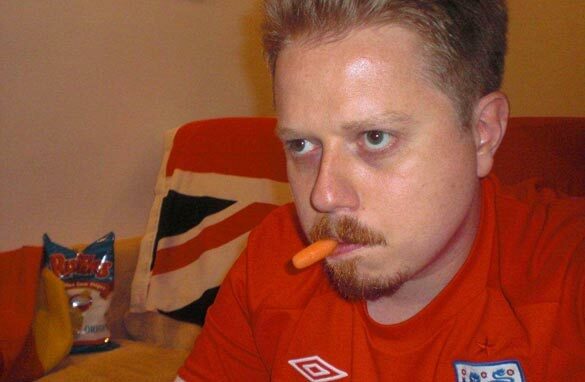 The gentleman in the photo with a carrot in his mouth is wearing an English shirt. Ignore those who criticize you my friend, they simply do not understand our game. Is there TiVo or DVR in Hong Kong ? Or must this fellow watch every game live !!!!! A true fan. So to Matthew booth- thanks for entertaining me between matches. That is awesome! It looks like the game is growing in the USA and even still abraod! Many many millions worldwide are actually watching all 64 games. The good news is the goals are coming fast and furious now after the mostly tenative first round! I hear astronaut's sleep in 20 minute intervals every four hours to keep working through their mission – maybe try that? Or was it the Marines? Either way you'll be in grand shape to be a sleep deprived parent one day. Keep hitting the carrots. This is the season when all HK employer's see productivity drop and bars see business booming almost as much as when the Fleet is in town. Even sleepy Lamma has residents out and about seeking bars showing the matches. Maybe you should do some filings from other locations than your house, at least you'll get some exercise in the process. Although your consumption of other things might go up too. It has been a pretty poor first week but things can only get better, I hope!!! Haha! I love it! People just don't understand how passionate us Brits are about our football.. I have also watched every single game but i have also had plenty of sleep and i am perfectly fine!!! Hold on, the off days are coming ! It's so easy to follow all the games here in U.S. I feel for you going through some borefests.. I am really starting to hate Italy, Any game they play, it's just utter boringness.. I watched all the matches...not the whole match but atleast a few minutes of each. I missed 3 because i had to travel. so that was ashame! well done Matt keep it up. at least england won at last. all a bit of a blur for me. better than devils for the USA game – half the people in the pub were asleep by half time!